In 12-inch skillet, melt butter over medium-high heat. Add rice, onion and salt; cook 8 to 10 minutes, stirring frequently, until rice is lightly golden brown. Stir in broth and water. Heat to boiling; remove from heat. Spray inside of 3- to 4-quart slow cooker with cooking spray. Pour rice mixture into cooker. Stir in carrots. Make sure all rice is under liquid and not sticking to side of cooker. Cover; cook on Low heat setting 2 to 2 hours 30 minutes. Stir in peas and bell pepper. Increase heat setting to High; cover and cook 15 to 20 minutes or until hot. Sprinkle with almonds and parsley. Rice will hold on Low heat setting up to 2 hours; stir occasionally. Transform this recipe into a more substantial main dish by adding 1 cup chopped cooked ham along with the peas. 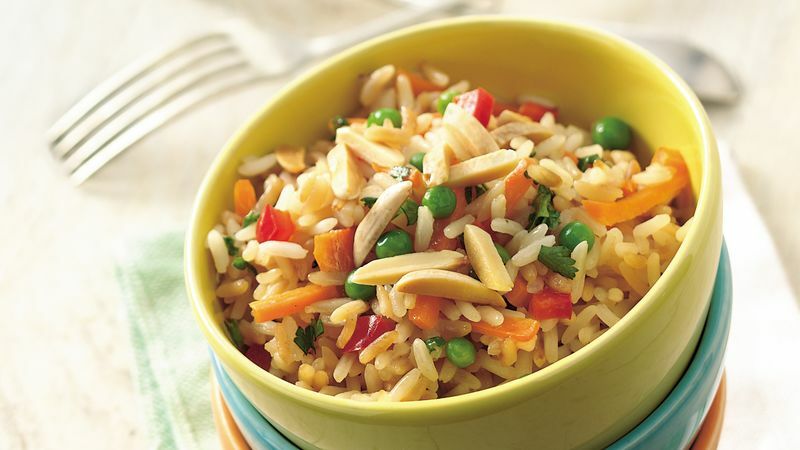 Use aromatic jasmine rice, which has a slightly flowery flavor, to enhance the fresh spring taste of this side.